I’ve been disappointed with my Giottos ball-head I bought last year. It wasn’t sturdy enough and had started to become unreliable far too quickly. So I started the research on a good quality affordable replacement. I looked at Really Right Stuff, Arca Swiss, Gitzo among other brands. Of all those I read about or trialled I really liked The RRS Ballhead but cost and timescales were prohibitive without actually trying it hands on. While looking for an Arca Swiss base plate I stumbled upon Sunwayfoto’s (www.sunwayfoto.com) products. I was impressed by their range, pricing and the quality others were alluding to. I decided to take the plunge and ordered the Sunwayfoto DB-44 fitted with an Arca Swiss compatible DDC50i quick release plate. This setup should be more than sufficient to take a Canon 5D MK III, BG-E11 battery grip, lens, Lucroit 165mm filter kit and perhaps a fitted Loupe. Not forgetting a trusty bag of risotto on top for good measure, more about that another time. Good quality feel and machining. The Sunwayfoto DB-44 head is nicely machined and has a good solid feel to it, very similar to the Really Right Stuff equivalent from what I understand. It is rated up to 30kg so should deal with all I can throw at it and more. I’ve found it simple to operate and very stable and I haven’t come across too many drawbacks just yet. The tightening screw on the DDC50i plate can be tricky to access, tucked under the camera but there is also a longer screw version of the plate I’m likely to add. 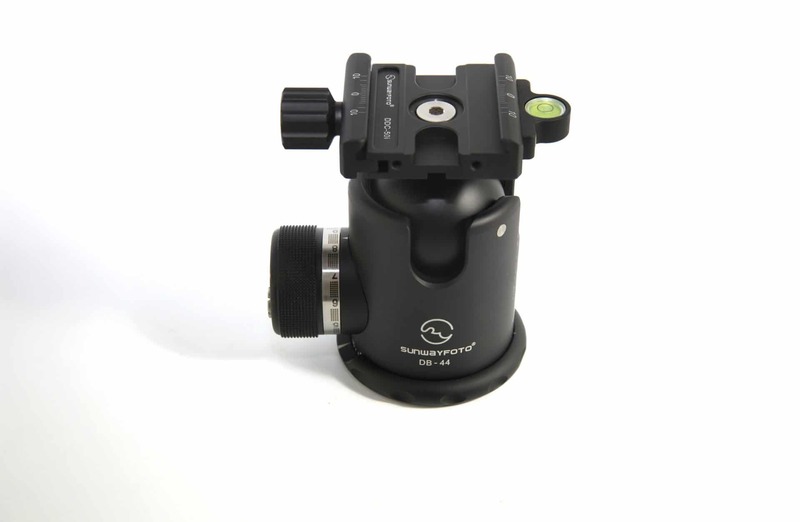 Just out and winging its way to our shores is the new Battery Grip compatible L-Plate by Sunwayfoto for the 5D Mk III. L-Plates offer a convenient and quick way to move the camera on the head between Landscape and Portrait mode. In the meantime a standard horizontal Arca Swiss mount will have to do. This entry was posted in Gear Review and tagged arca swiss, ballheads, canon 5dMKIII, db-44, landscape photography, landscapes, rich clark, rich clark images, stability, Sunwayfoto, tripods.